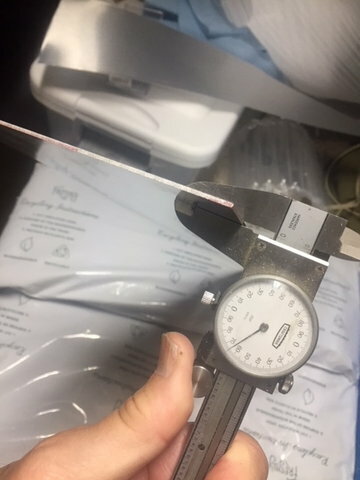 Is that stuff about 0.25” thick? Using all the stock hardware and so far one small mod. For the P80 i needed to use the narrow rails and instead of mounting the engine on the bottom, ie i would have had to cut the bottom cover, i installed asub rail above the stock and releived the stock rail so its actually a 1/4" higher up in the bay. 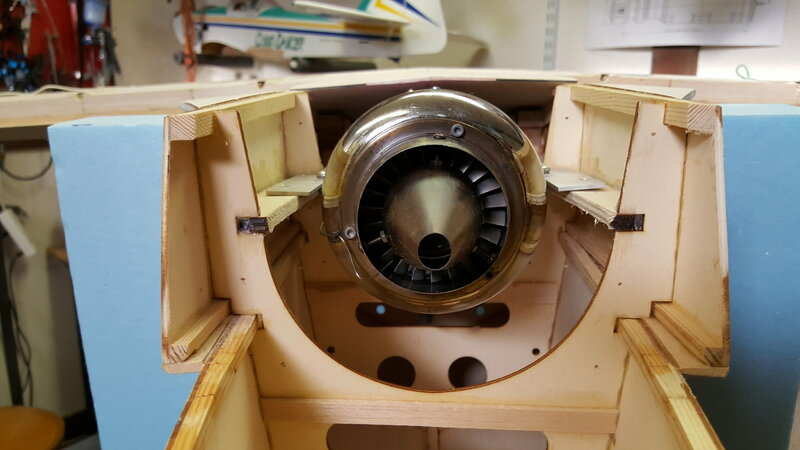 I kept the stock 6 degree angle and will add washers under the aft mount bolts to increase as needed. 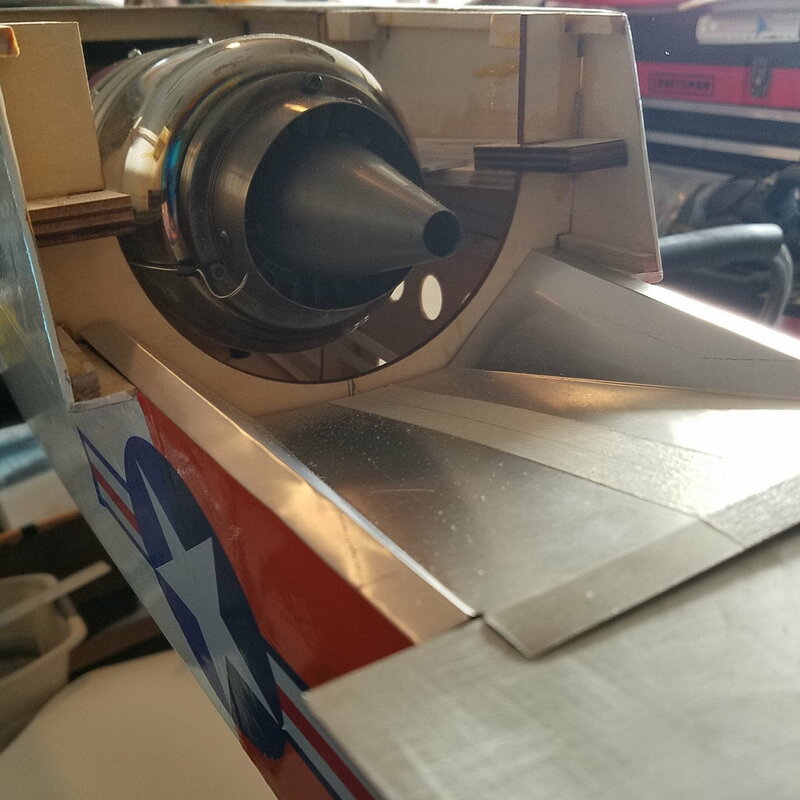 The exhaust came to a littel above the sheet metal rear cover so i mod'ded the sheetmetal using the the thin flashing as mentioned here. Being an A&P sheetmetal mech in my prior mid life, i fashioned a new cover nearest the engine. Hope to hear from others as this thread has been chirping for a while. I have had mine for a couple of years now. I used the hardware the came with the ART the only thing I needed to replace was the hinges. I found out after I had installed them that they are very bridle and they where breaking off, at least the ones that came with my ARF, I did find this before I flew it.I must say it is not ease to remove the old hinges. I used the 6 degree angle and on the engine. I used a K T 120 for flying off our grass field. I had to cut the bottom plate that goes over the engine, NP I hope this is of some help. Flashing metal used and will be two piece rear cover. The rear bottom cover plate fits without having to cut out for the engine. 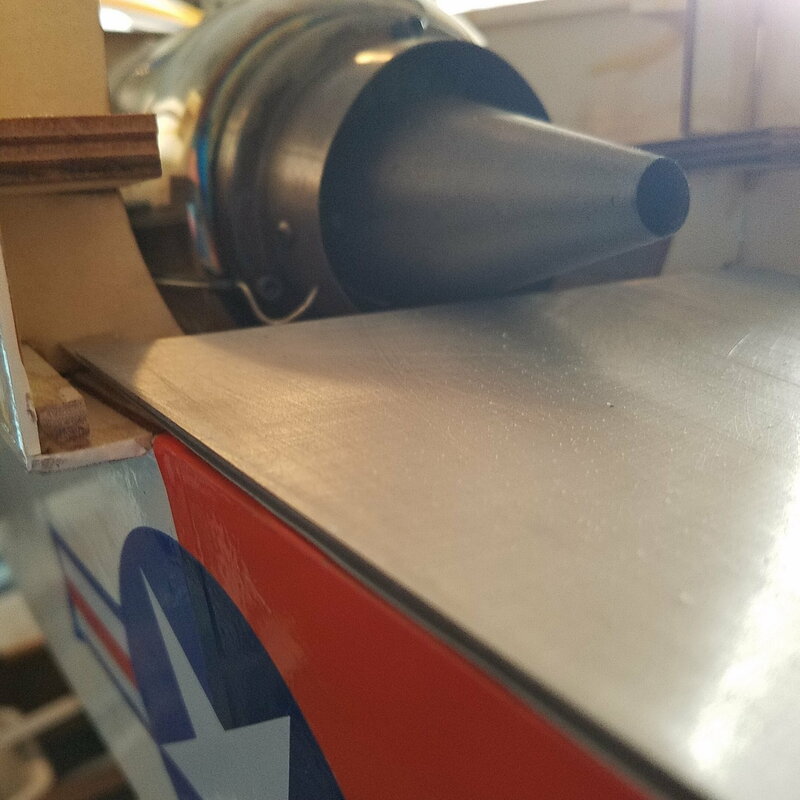 Here are the pics of my sheetmetal mod i did for the rear. If i have to add angle to the engine then i may have to relieve it slightly but will see when the maiden happens. Wow you did a nice job, good for you. Well, im setting up for my maiden tomorrow on my V2. JC P80 propane, pretty much stock build, Pro-Link electrics and AR12120 connected to a 11X On the road toward obtaining my waiver also. Pic to come later. Hello sam@ataI´m about to lay the last hands on a Turbinator with a JetCat P-80. I´m curious about how much weight you have added to the nose? Curious if smoknrv4 has flown his. I installed the same thin flashing on the rear but during my test runs it waved and distorted due to heat. I had large gaps between the fuse and sheet between each fastener location. Once done running and it cooled, it went back to flat. I have an idea so I’ll post pics if ir works. 1. I had to add .25"under the the rear mounting bolt holes(7 degrees) more down thrust to the engine for a total of 13 degrees. This was just right and i still didnt have to cut out the bottom cover and inverted flight took min down elevator. 2. Throws as given are great for HIGH rates so no more than given is needed so i would suggest setting a DR at 70% with 30% expo on Ail and Ele for your start. 3.At least on mine, the thin flash sheet metal buckled under the heat and waved between the fasteners so i kept my first mod posted earlier and then changed out the remaining rear portion to the metal stock as supplied. No heat distortion and issue fixed. 4. On the fourth flight on this plane i was able to obtain my waiver sign off as its just a nice plane and that stable. 5. Added 13.5 oz under the battery compartment floor and that is with 2 4500ma LiFe rcvr packs, a 5000ma 2s ECU bat and a 3600 2s gear/brake bat up front. Total dry weight is 25lbs and maybe 2 oz. So there you have it, done deal from maiden to waiver. I plan to have lots of follow up flights in the next two days and plenty of touch n go's to become more familiar with flight characteristics. Last edited by sam@ata; 10-12-2018 at 04:47 PM. Last edited by R/CBOONE72; 10-20-2018 at 06:24 AM. It will fly the plane, but grass takeoff roll will be long. How long is your club runway? 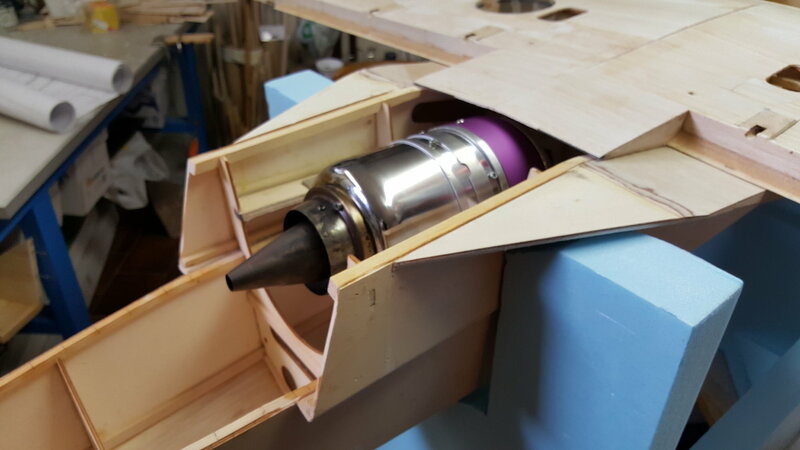 Just to give you as to how much thrust is enough, my Boomerang XL is 42 lbs on TO ( 50 oz smoke fluid included ) been pushed by a 27 lbs thrust turbine, carrying a gallon of fuel, the TO run is like 300 feet long to be on the safe side, climb out feels heavy but it is moving, climbing with plenty of energy, after 3 to 5 minutesof flying it is moving fast ( as fast as Boomerang can move ) it didnt have for ever vertical but it climbs high enough for me, landing is at around 34 to 35 lbs, dry weightis 32 lbs. I have a Turbinator that I build some time ago from a kit, I'm estimatingdry weigh will be 19 1/2, the K85 will be more than enough for it to have fun for a while. I have about 600ft of mowed grass strip 90 feet wide with no obstructions except for a high kv power line about 1/4 mile put. The runway has some bumps so for the sake of the undercarriage I only have 300 smooth feet. More than enough I will say, if I had mine running I would've done a few TO off grass for a YT vid. Last edited by CARS II; 10-20-2018 at 09:12 AM. The K85, as mentioned above will be plenty off grass. As to my runway, FYI, i have 800' paved and the same grass right next to it. 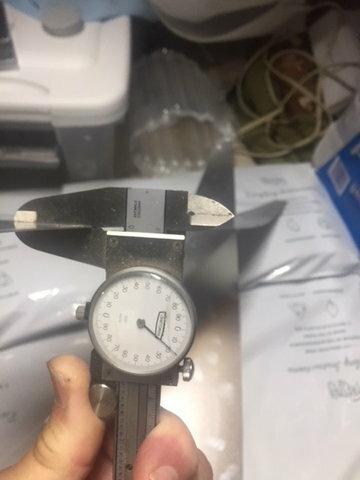 My dry weight came out to 25lbs and TO is with a gallon of fuel and if my A&P memory recalls, i think we used 6.6lbs per gallon for specific weight of JetA. I believe the Turb2 with the 85 will be an overpowered setup and that could lead to issues in landing speeds being higher than needed and as your first jet, that will get you into trouble. 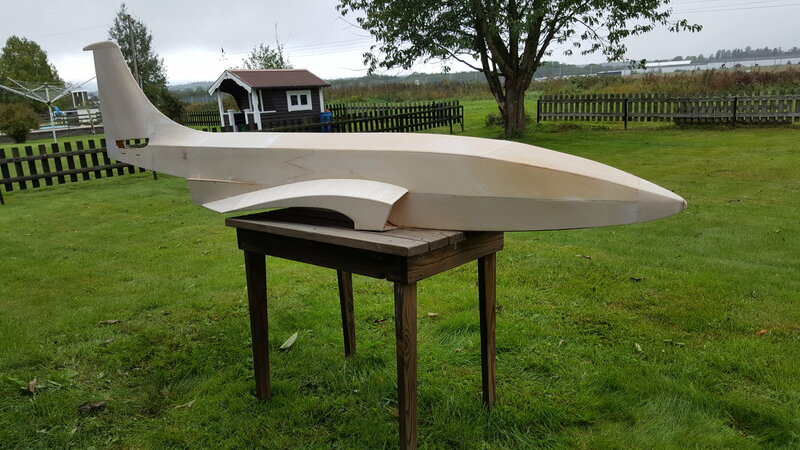 If your getting the KT85 then i would suggest opt for the larger Turb V2 and if an 81" plane is to big, save some money and go with the Turb2 ARF and use a 60 size motor. I feel you will not be disappointed on either setup. Last edited by sam@ata; 10-20-2018 at 02:19 PM. I could definitely enter the market alot cheaper with the turb. 2 and a swiwin 60 however my thinking is the 85 will transfer to a wider variety of Jets should I upgrade and I do not have the money for more than one turbine setup unless I sell my 100cc and 50cc birds. I can tell you exactly what expect, I have one with an original JC Rabbit that puts out 19lbs. Plane came is a just over 22 lbs. We have 700' of grass and with 15 degrees of flap and I seldom take 1/2 the runway to get up. Just got back from Louisiana Jets and it got off in about 150' from asphalt. I have Pro-Link trailing link struts from Dreamworks, they do a great job of absorbing the bumps.